The Lambent coaching methodology is currently being used in over one hundred trainings a year in over thirty countries. It has been used to train over twelve thousand people in sixty countries since 2001. It is structured and delivered using principles of Andragogy (Adult learning principles) that engage, motivate and efficiently pass knowledge and skills to adult learners. The Lambent International Coaching Certification Training certified by the ICC at their level one, has been independently evaluated according to University Standards. It has been awarded a European Quality Award (EQA) in 2010 by the European Mentoring and Coaching Council (EMCC). It therefore also meets the requirements of the International Coach Federation (ICF) ACC Portfolio path. The structure and content of the Lambent course is designed to give the students knowledge, skill and self development. It is applicable to business people at every level. The method is suitable to develop executives and for executives to use to develop others. The Lambent coaching methodology is international. It is used exclusively by the International Coaching Community (ICC). ICC is one of the largest professional membership organisations for coaches in the world. It was established in 2001 and is a Not for Profit company registered in London UK. It has trained over 12,000 coaches in 60 countries since 2001 using the Lambent methodology. There are currently 46 trainers worldwide training with this methodology. The methodology follows the three foundational knowledge traditions of coaching. a) Humanistic psychology and the works of Abram Maslow and Carl Rogers. — People have a valid experience of their own values and goals. — People want to be the best they can be. — Everyone is unique and valuable. — Everyone wants to have a choice and to exercise choice. These are basic principles of all schools of coaching. This viewpoint comes from Cybernetics and the works of Heinz von Foerster. Constructivism developed the idea that we help create the world we live in. Our perception of reality is as much a construct of our minds as what is in the world outside us. Therefore coaching needs to discover the world the client is constructing and not try to give them a right answer. People describe the world and themselves in language, and the structure of language shapes their thinking and limits it. Coaching takes into account how the language the client uses is a clue to how they are thinking about their issue. Ontological coaching. Ontological coaching focuses on the client’s way of being, the dynamic interaction of the client’s language, emotions and physiology. There is a strong emphasis on listening, language patterns and emotions expressed in physiology. The Lambent methodology takes these dimensions into account; the client is a whole person, mind, heart and spirit. The principles of Ontological coaching are taken mainly from the writings of James Flaherty, Fernando Flores and Rafael Echeverria. Integral studies. This rapidly developing field of transpersonal psychology has been pioneered by the writings of the American Philosopher, Ken Wilber. The integral model uses a number of different perspectives to gain as full an understanding of a situation as possible. It looks at lines of development, states of mind, types of psychology, and stages of development. It uses interior and exterior, individual and collective perspectives. Perspectives are an important part of the Lambent methodology and Integral studies provide some very useful ones. Inner Game and Co-active Coaching. The Inner game methodology was very important in the development of coaching. Pioneered by Timothy Gallwey, it focused on defeating your inner opponent to become your best. The method was brought to Europe by Sir John Whitmore. Co-active Coaching is a model originally also developed in the United States, by Laura Whitworth. The four principles are that the client is naturally creative, resourceful and whole, coaching addresses the client’s whole life, the client sets the agenda and the coaching relationship is a partnership. Co-active Coaching also places emphasis on the coach’s intuition as a coaching tool. Positive Psychology. This follows Abram Maslow’s ideas of self actualisation. The approach has been used in the United States and developed by Martin Seligman. Positive psychology concentrates on mental well being and researches positive emotions and what people can do to build more of them into their life. Hope and Optimism as character traits are seen as very important. This has led to a school of coaching known as Authentic Happiness Coaching. Neuro-Linguistic Programming (NLP). A system of psychology started by Richard Bandler and John Grinder in the United States in the nineteen seventies, and subsequently developed by Robert Dilts, NLP is the study of the structure of subjective experience and studied outstanding communicators to see how they achieved their results. Its focus is reflected in the name, ‘Neuro’ is the mind, ‘Linguistic’ is about language and ‘Programming’ is about sequences of actions to achieve a goal. NLP adopts a pragmatic approach, based on models of excellence, and teaches many important skills and tools used in coaching. The designers of Lambent methodology, Andrea Lages and Joseph O’Connor have written two books on Coaching. Their second book, ‘How Coaching Works’, was nominated for the Financial Times Best Business Book of the Year in 2007. The Lambent methodology and design follows principles of adult learning (Andragogy): Adults are autonomous and self-directed. They want to be free to direct their own learning. Trainers need to be like facilitators, and guide participants to their own knowledge rather than supplying them with facts. Adults need to connect learning to their knowledge and life experience. Adults learn best when their relevant experience and knowledge of the topic is drawn out and utilised and theories and concepts relate to that experience. Adults are goal-oriented. So trainers need to show participants how the training will help them attain their goals. Adults need to see learning as applicable to their work or other responsibilities to be of value to them. Adults are practical, focusing on the aspects of a lesson most useful to them in their work. Adults need to be respected. Adult learning follows the Kolb learning cycle of Experience, Reflection, Conceptualisation and Testing. The structure of the Lambent coaching course and the way it is trained follows these important principles. All our trainers are highly experienced and trained specifically in the Lambent methodology and approach. Executive coaching is a very important application of coaching. Coaching executives to make better decisions, work better with teams and clarify their goals and values, is an enormous help and can have great impact on themselves, their team and the business. This impact can be measured financially. The focus on coaching executives is to develop their authentic leadership so they can be their best, and develop other leaders in the organisation. There is a balance between the business approach where coaching objectives need to be aligned with organisational and business goals, and coaching the executive as a unique individual, respecting his or her strengths and developing his or her potential. The Lambent methodology is well developed to do this in an efficient and effective way. The International Coaching Community uses the training programs and methodology created by Lambent. 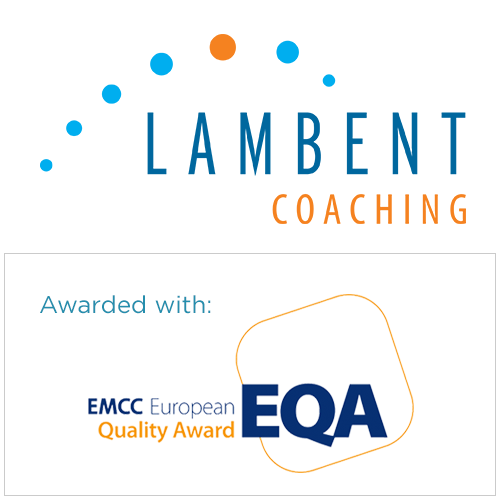 The Lambent coaching methodology was awarded with the European Quality Award (EQA) in 2010 by the European Mentoring & Coaching Council (EMCC), and has been used to train over 12,000 people in 60 countries since 2001.